The Ballinaclough (Ballynaclogh) gravestones went ‘online’ on 16th August 2017. This marked the successful completion of phase one of the Graveyard Project. 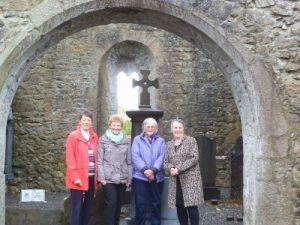 The project to digitise the headstone inscriptions in the three graveyards of Silvermines parish was undertaken by Silvermines Historical Society (SHS). It got underway in April 2016 under the guidance of Historic Graves Ireland and Eachtra. Groups of SHS members initially trained by Dr John Tierney of Eachtra, photographed and transcribed all the headstone inscriptions. Subsequently a small group of five members continued the work of validating the information. It was a slow process, oft times on their knees with a special torch extracting the information from the mossy stones and deciphering some interesting epitaphs. It was never tedious and there was time for tea and a chat with any visitors to the graveyard. The summer months brought frequent tourists from abroad – a stranger looking for a long dead ancestor, was often delighted to receive any information from local residents. Ballinaclough Graveyard is steeped in history and this has been well documented by local historian Tim Boland, in particular in his Reflections on Ballinaclough Graveyard in the Nenagh Guardian dated November 26th 1994. On entering the graveyard, one feels the sense that history and when an aged tree at the back fell down last year the rings of time are there for all to see. And yes, Thomas Grey could well have penned his famous lines in a place like this….. The online graves can be accessed by visiting Historic Graves Ireland and selecting the name of the graveyard. A detailed map of the grave locations designed up by SHS member Paudie Collins is also online. Please note the old spelling of Ballynaclogh.